CFD (Contracts for Difference) trading is increasingly popular with experienced investors, but anyone can try it. Most online trading platformsTrading Mechanisms - TradingTrading mechanisms refer to the different methods by which assets are traded. The two main types of trading mechanisms are quote driven and order driven trading mechanisms offer contracts for difference trading to their customers. It is a potentially high-risk trading strategyTrading & InvestingCFI's trading & investing guides are designed as self-study resources to learn to trade at your own pace. Browse hundreds of articles on trading, investing and important topics for financial analysts to know. Learn about assets classes, bond pricing, risk and return, stocks and stock markets, ETFs, momentum, technical, but as long as you understand how CFD trading works, you can minimize your risk exposure. CFD Trading is a type of derivative tradingNew York Mercantile Exchange (NYMEX)The New York Mercantile Exchange (NYMEX) is a commodity futures exchange located in Manhattan, New York City. It is owned by CME Group, one of the largest futures exchanges in the world, that also runs the Chicago Mercantile Exchange and Chicago Board of Trade. whereby you speculate on the rise and fall of prices of securities. You can trade a range of assets, including stock shares, foreign exchange, commodities such as gold and silver, and indices. CFD trading provides access to more than 10,000 global markets, and because every trade you make is leveraged, you do not need much capital to begin trading. The difference between CFD trading and buying/selling a security is that you do not invest in the actual asset. 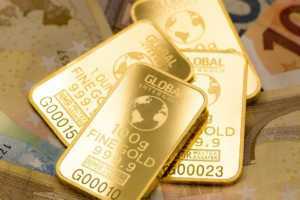 Instead of buying or selling physical gold, for example, you merely speculate on whether the price of gold will go up or down. If you’re properly aware of the risks and want to start trading online, then you can open a CFD (Contracts for Difference) Trading Account with a company such as IG. Opening an account is free, however, there will be a charge on each trade by way of either a spread or commission. IG has relatively low minimum contract sizes for new clients, although you will be required to put down a margin deposit. Once you start trading, you’ll find that trading CFDs can be an effective way to gain exposure to financial markets with less capital (but more risk). Always consult a professional advisor before making any investment decisions. Using gold as an example, we know that demand for gold began to fall in Q4 2017, so prices declined accordingly. In fact, prices dropped to less than $1,250 per ounce and some analysts forecast that gold will drop even further, potentially below $1,150 per ounce by the end of 2018. The expected decline is, in part, due to rising yields from U.S. investment bonds and strong U.S. tax reforms planned for 2018. It is clear that gold prices can go either way, so it pays to follow economic data, in particular, U.S. interest rates, as they directly affect gold spot prices. If you decide that gold prices will rise, you should go “long,” which means buy. But if you suspect that gold prices are more likely to fall, you should go “short,” or sell. TradersTrading & InvestingCFI's trading & investing guides are designed as self-study resources to learn to trade at your own pace. Browse hundreds of articles on trading, investing and important topics for financial analysts to know. Learn about assets classes, bond pricing, risk and return, stocks and stock markets, ETFs, momentum, technical who guess market movements correctly make a profit based on multiples of the number of CFD units traded. However, if you get it wrong and the price movement goes against you, you will incur a loss. The attractiveness of CFD trading is that you only need to invest a small percentage of the full value of the asset you trade. Trading margins can be as low as 1%, so if you take a position worth $20,000, it may only require a $200 deposit – which is not a huge amount for an armchair investor. If you have a profit marginNet Profit MarginNet profit margin is a formula used to calculate the percentage of profit a company produces from its total revenue. The profit margin ratio of each company differs by industry. Profit margin = Net income ⁄ Total revenue x 100. Net income is calculated by deducting all company expenses from its total revenue which is, the money you earn will be based on the full value of the asset. This means that your profits can easily exceed the amount of the small margin deposit required to hold the CFD. However, if you get it wrong and take a loss, you can, conversely, end up losing more than your initial investment. Therein lies the primary risk of CFD trading. You may also be subject to holding costs if your positions are still open at the close of trading – i.e., held overnight. There will also be commission fees, depending on which trading platform or broker you use. CFD trading can be a very useful – and profitable – strategy if you are looking to hedge investments in the underlying shares and assets the CFDs represent, especially if the market is volatile. Of course, you can also just trade CFDs outright, on their own. It’s not required that you already have other investments and solely use CFDs as a hedging investment. Just make sure that you fully understand the risks involved before you begin trading CFDs. Guide to Commodity Trading SecretsGuide to Commodity Trading SecretsSuccessful commodity traders know the commodity trading secrets and distinguish between trading different types of financial markets. Trading commodities is different from trading stocks. Eurex ExchangeEurex ExchangeThe Eurex Exchange is the largest European futures and options market. It primarily deals in Europe-based derivatives. A wide range of trading on this exchange is carried out, from European stocks to debt instruments of Germany. Contango vs BackwardationContango vs BackwardationContango vs backwardation are terms used to describe the shape of the futures curve for commodity markets. The futures curve has two dimensions, plotting time across the horizontal axis and delivery price of the commodity across the vertical axis.